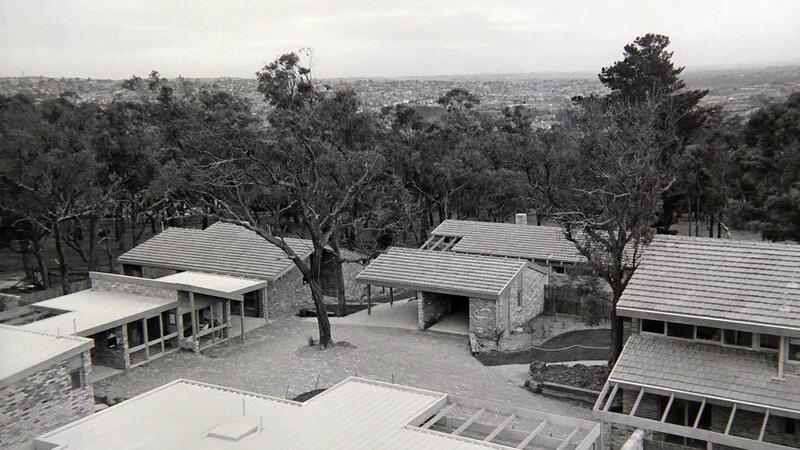 In Australia in the mid-1960s, the housing market was experiencing the boom of a new phenomenon, project houses. These were architect-designed houses offered by a new series of building companies that promised better quality design than the average speculatively built house. In 1965 Melbourne entrepreneurs David Yencken and John Ridge founded one of the nation’s most influential project house-building companies, Merchant Builders. For the next 26 years, Merchant Builders set new benchmarks for residential architecture in this country, but also actively encouraged consideration and inclusion of landscape, indigenous planting, site planning, and interiors as a total package. A flyer for Merchant Builders Pty. Ltd. (c.1982). Designed and illustrated by Bruce Weatherhead. Written by Jeremy Press. Yencken and the firm’s consultant architect Graeme Gunn and consultant landscape architect Ellis Stones were also deeply interested in how to increase density in Melbourne’s inner and outer suburbs without losing the amenity of connection with landscape, and especially indigenous trees and plants. They were committed to a suburban landscape that was uniquely Australian. 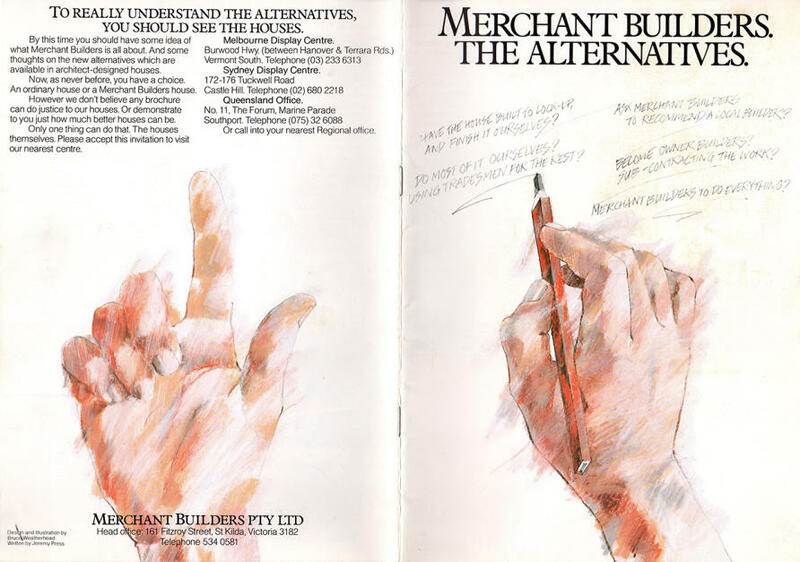 The fifty-year legacy of the work of Merchant Builders has become the focus of a student-based research project and exhibition within the Melbourne School of Design. Led by Alan Pert, Philip Goad and Gini Lee, the project and resultant exhibition documented the achievements and chronology of a firm that stretched its tentacles across most of Melbourne’s design professions. Merchant Builders Pty Ltd resulted in the founding of the interior design firm, Nexus Designs in 1967 and the landscape architecture and planning firm, Tract Consultants in 1973. And swept along was a host of architects, landscape architects, interior designers, graphic designers and photographers who all contributed to the firm’s award-winning success and remarkable longevity in the face of Australia’s economic and political highs and lows in the 1960s, 1970s and 1980s. The project and exhibition used the Merchant Builders timeline as its organising structure, allowing students to research specific projects, people and events. It was a way of exploring the evolution of the company while anchoring each year with a chronological yardstick. The project and exhibition makes the case for a new archive and repository recognising the cultural significance of the work of Merchant Builders while at the same time encouraging further research. “David Yencken, Graeme Gunn and with John Ridge established Merchant Builders in an attempt to tackle issues of design quality and choice but more importantly affordability. They argued for a better future for Australian cities in the late twentieth century,” says Alan Pert. The Merchant Builders collection celebrates past achievements but also provokes consideration of the fundamental issues of equity between home ownership and home rental, according to Pert. The students started with a single box of archival material assembled by Anne Gartner as part of her PhD Thesis at Monash University in 1991. The material was passed on to Adam Mornement and then onto Graeme Gunn before it arrived at the MSD in August 2015. The students had already begun collecting material on Merchant Builders beforehand. “The breadth of the work that has been uncovered in such a short period of time [12 weeks] suggests that there is still more out there, lots more,” says Pert. Exposing material, which has been lying dormant and un-scrutinized for a number of years, provides the opportunity to review the material and see it as a collection and a larger prolonged experiment rather than a set of stand-alone residential prototypes. “The collection makes us consider what lies ahead for how we live and how we relate to our landscape, our suburbs and our cities. We are able to provoke visitors to consider the relevance of Merchant Builders today and in the future,” says Pert.